Nobody can do everything, but everybody can do something! The Blue Nile is one of the two main courses of the river Nile. The Saharan part of the river is formed by the union at the capital of Sudan, Khartoum, of the White Nile coming from the lacustrine region in Eastern Africa, and the Blue Nile coming from the Ethiopian Highlands. Though with a shorter length, the Blue Nile course amounts to more than 60 % of total Nile water flow. 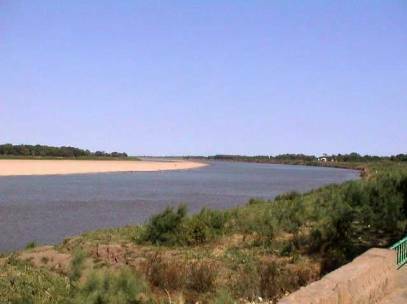 Historically the river was one of the main roads for the contacts between the clay plains of the arid Sahel and the higher volcanic plateau of Abyssinia, yet conflicts and wars raged after the first area came under Islamic rule in the XV century AD (the Funj Sultanate at Sennar). The possibility for the Christian rulers of the Highlands to control its water flow, even if technically impracticable, was always seen as a menace by the northerner states. Although Western explorers have been drawn to the beauty and mystery of the Blue Nile since Europeans first walked along the shores of Lake Tana centuries ago, the river was never fully mapped until thirty years ago. territorial integrity of Sudan'" (Agence France-Presse, April 30, 2003). policy decisions are not encouraging. to which Khartoum has interfered with humanitarian access). Department report of April 21 made no mention of the Machakos Protocol. by Mubarak himself. Egypt cannot have been more explicit. hostility to one of the key terms of the Machakos Protocol. the key issues since the signing last July of the Machakos Protocol. agreement to "cease supplying all areas with weapons and ammunition"
issue of a southern self-determination referendum. Department and its Africa Bureau think that no one is asking. held on Friday April 4, 2003, at the ISS. proceedings of this public meeting will be briefly summarised. religious or secular nature of the state. Machakos, Kenya, with the signing of a framework peace-agreement. future, the agreement has indeed been the most hopeful sign in years. parties. The Netherlands offered to host the meeting. other countries from the EU and beyond. journalists and members of the Sudanese community in the Netherlands. took place, chaired by Mr Jos van Beurden. summarised the conclusions reached in the Noordwijk conference. on what to do in the pre-interim and interim periods. and in planning for longer term development. auspices of the IGAD Partners Forum, in Oslo, Norway. that is hindering Sudan's economy is the $ 20 billion external debt. should be devised to address the issue. cultural dimension of the conflict has not been adequately addressed. hostilities are adequately addressed in the final peace-agreement. forced to incorporate their structures, concerns and priorities. Sudanese people, and in particular civil society, in the peace process. the importance attached to this issue. general support of the Sudanese people and the international community. process and defies the criticism of its historical ally. which is a task that belongs especially to civil society organisations. throughout the country about the peace process. parties could make their contribution. role in creating a favourable atmosphere for peace and reconstruction. priority from the very beginning. co-ordinate and harmonise all these efforts and set the overall agenda. advice and expertise to the Dutch government. Protection Monitoring Team (CPMT) were suspended by Khartoum. I'll never forget what the Commissioner told me next. will still see them if you go away from the airstrip." unburied? He replied, "We are too weak from hunger and disease. the area, vultures were gnawing on human remains. torso dragged away and left in the tall grass. help stop Sudan's hidden holocaust of Christians. was a student of his father, the late Bishop Butros Shokai. invaders during the last several years. faith despite unimaginable suffering and great personal loss. In late January, 2003, an international team of US and Canadian experts traveled to Liang, Upper Nile Province, where they discovered fields littered with human remains, many of them from young children. Interviews with local survivors confirmed that the remains were those of victims of an unprovoked attack upon the unarmed civilian villages of Liang, Dengaji, Kawaji and Yawaji in late April 2002. It is estimated that between 1/3 to 1/2 of the original 6,000 civilians living in the region were killed in the attack. The attackers were reported by the survivors to be Sudan regular army from the Boing Garrison, commanded by Brigadier General Ibrahim Saleh. Striking in the early morning while the villagers slept, the heavily armed Government of Sudan (GOS) soldiers began killing the unarmed residents and burning their houses. The attackers were reportedly armed with 60 mm mortars, rocket-propelled grenades, 12.7mm heavy machine guns and AK-47 assault rifles. In a videotaped interview, Mr. Tunya Jok described the horrors as he witnessed his 4-year –old daughter shot and killed as she fled from the GOS soldiers. Then his 6-year-old son was captured and beheaded by the soldiers. His body was thrown into a burning hut and his head planted upright facing away from the hut. Servant’s Heart, Freedom Quest International and The Voice of the Martyrs (Canada) call for an investigation by the international Civilian Protection and Monitoring Team assigned to report on violations of the March, 2002 agreement between the Government of Sudan and the Sudanese People’s Liberation Movement. Among other things, both sides agreed not to attack civilian targets. We also call on the US State Department to include this incident in their Sudan Peace Act-mandated report to Congress on atrocities and war criminals in Southern Sudan.